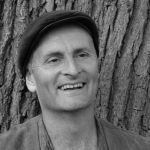 Ben Law trains apprentices and runs courses on sustainable woodland management, roundwood timber framing, coppice crafts, and permaculture design. He was a founding member of the Forest Stewardship Council. He also has worked for Oxfam as a permaculture consultant. He is the author of The Woodland Way: A Permaculture Approach to Sustainable Woodland Management and The Woodland House. He lives in West Sussex, UK. Law’s woodland house has been featured on The World’s Greenest Homes, a series of the Discovery Channel’s Planet Green. Ben’s latest book is Roundwood Timber Framing, a full colour guide to his building techniques. His website is www.ben-law.co.uk.